A big thank you to all who have and still are supporting the eYe program. Through the interviews with the many young people who applied to the eYe program we have selected a very strong cohort. The program has started and we are already proud of the young people and their ability to progress, their eagerness to learn and their strong energy. What a brilliant start!!! 61% of European employers say they cannot find young talent with the right skills. 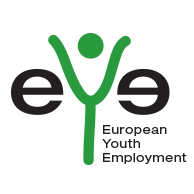 7.5 million young people in Europa are out of job, education or training, creating an economic loss of 150 billion Euro. The goal of eYe is to provide employers access to young talent with the right skills quickly and cost effectively and increase the employability of young people. Since the launch event in November 2014, we have focused our attention on Portugal. Here we will kick-off the first eYe-Certification pilot in summer 2015. 30 unemployed young people will get the chance to join our 6 months program that includes a unique combination of physical and virtual workshops, peer-to-peer coaching, English sessions, communication and self-awareness training as well as an internship with employers in the CircularSociety community. The eYe-Certificate prepares participants for the job requirements. At the same time we enable employers to increase their productivity as they gain access to the pool of eYe-graduates. The pilot will be launched at the YMCA in Setubal (Portugal), which has become our third CircularSociety Center. Our growing impact community in Portugal includes organizations like the World YMCA, Education First (EF), Talentory, AIESEC, ATEC, Polytechnic Institute Setubal, Kelly Services, NOVA, CCISP, Science4You, Jobzippers and others. Every little, concrete step to bring young unemployed people in Europe (back) in to work is worth our efforts. Every person counts! We see our activity as a critical contribution to Europe’s sustainable future, as it brings economic as well as social balance. Share this website and follow CircularSociety on its social media channels. Here is a list of the private individuals who donated towards making the eYe programme happen.